A few rounds of thunderstorms visited us yesterday, but luckily, those are in the past and conditions will be improving (mostly) for our Sunday. The storms are gone and we’ll see breezy but sunny weather to finish the weekend. It’s Windy. No, it’s Sunday! We’ve still got southwesterly winds in place to start our Sunday, but the moisture is long gone, meaning dry weather but stout breezes remain. 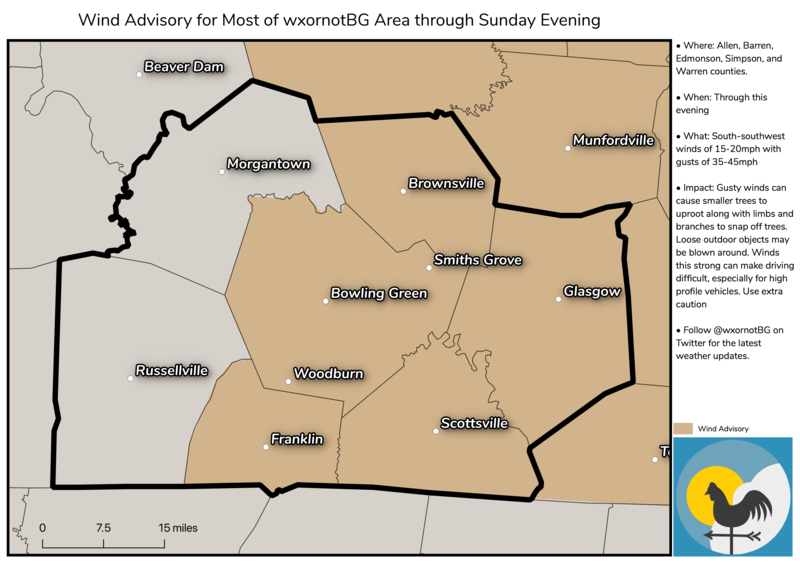 Breezes so stout, the National Weather Service has gone and hoisted a Wind Advisory through this evening. Just make sure we don’t see Santa and the reindeer floating into the next county this afternoon. It will be yet another warm day around the area, with high temperatures attempting to push 70º. Yes, on December 2! Enjoy it now, because it won’t last. The washed out boundary that will cool us down will move through during the day, and by nighttime we’ll be falling back to 35º with partly cloudy skies. We, as well as our temperatures, will fall back to Earth to start the week, as we fall just slightly below normal (average is around 53º) while clouds increase over the region. A mostly cloudy day will be on tap as a dry boundary attempts to squeeze a sprinkle or two out of a mostly moisture-starved atmosphere. Temperatures will remain just as boring, only topping out around 51º. Overnight, things remain just as boring, bottoming out around 34º for a low temperature with the same mostly cloudy skies. Another disturbance tries to work in here for Tuesday, but again, things are much too dry for anything more than a few sprinkles…if that. Outside of a slight chance for a sprinkle, things stay mostly cloudy for Tuesday. Temperatures tumble, down to around 40º for a high…yes, during the day. Clouds start to decrease at night, but still, we’ll find ourselves with a chilly low of 25º.